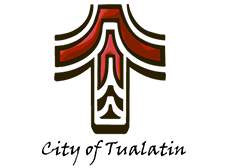 The City of Tualatin, population 27,000, is a dynamic, vibrant community conveniently located just 12 miles south of Portland and 30 miles north of Salem, the state capital. Situated at the intersection of Interstate highways 5 and 205, Tualatin is a short distance to adventure: skiing, snowboarding, and sledding on majestic Mt. Hood in the Cascade Mountain Range; family-friendly summer water activities on the central Oregon Coast; national-level wind-surfing or parasailing on the Columbia River, while enjoying the natural beauty of Multnomah Falls in Columbia Gorge National Recreation Area.